Not that I’m fashion-forward or anything, but my first foray into colour pop was in 1994, the same year I had an extremely early ‘life-crisis’. I’d spent the summer in Israel, having romances with soldiers/teachers (well, one of each, I’m not that much of a hussy) and crossing borders I shouldn’t have been crossing on the back of a big motorbike. I came back to the infinitely less glam and dangerous surrounds of Huddersfield University determined to ‘shake things up’. Jaysus. What better way to baffle and create drama than buying a shocking pink plastic skirt from Miss Selfridge, matching it with all-black tops, tights and platforms, and parading around the student union like this was completely normal behaviour? I know. I am a genius. There is photographic evidence of this stunning style statement, but even I’m not brave enough to post it, so you’ve got Girls Aloud going a bit OTT instead (to the left, to the left). What I’d captured, aside from the pointing and staring, was a fledgling attempt at full-on colour pop – matching an otherwise sedate outfit with just one mega-bright, eye-popping, colour-soaked item. It’s big for spring and it’ll save any potentially boring outfit from the doldrums. Plus, if you adhere to the scientific Yorkshire saying, ‘ne’er cast a clout till May is out’ (it’s bloody true, ask my gran), you can use the trend to inject your wardrobe with a birra summer, without exposing corned beef body parts before they’ve been adequately self-tanned. Colour popping is a tidy little trend because anyone can make it work. I’ll be honest, I colour pop most of the time, trend or no trend. Usually it’s subtle – a ridiculously bright bangle with an LBD, for instance. But you can also be a bit more daring, whatever your size and shape, with a pair of insanely bright shoes, or a coat that stops traffic. 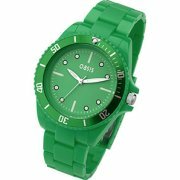 I’m obsessed with all thangs green, so colour popping is the ideal opportunity for me to inflict my collection of emerald slippers on the world – and I now have a valid reason to buy that there chunky and delicious watch from Oasis. If pink does it for you forget pastels and go all-out with this cute boxy jumper from ASOS, groovy dress by Illustrated People for Topshop and triple detail courts from Faith. Yellow’s a harder colour to pull off, but when you’re doing colour pop, it doesn’t really matter if it suits you or not, as we’re only talking about a dash. I’m loving this check floral clip by Miss Selfridge, rose ring at Topshop and who wouldn’t want these to-die-for Louboutins? For more unusual and eye-catching colour popping, this coral corset from Topshop is flippin amazing; these Office fushia pumps are v purdy indeed; Uniqlo do a nice line in purple skinny jeans; and the lime double breasted jacket by Julien MacDonald at Debenhams is a wee bit tasty, non? Avoid red (boring!) and just do one piece of popping at once to really pull it off. That’s another weekend sorted, then. This is a trend? Who knew? My wardrobe is already full of this stuff (not louboutins, obv, but masses of colour). Hurrah. I am so on trend. But where do the nudes come in? Where, eh?